Marvel Comics has provided ComicBook.com with an exclusive look at Greg Land’s Deadpool Variant cover for Spider-Man 2099 #4. Land’s cover pays homage to John Romita Sr.’s The Amazing Spider-Man #121 cover, the first part of the two-part “The Night Gwen Stacy Died” story. 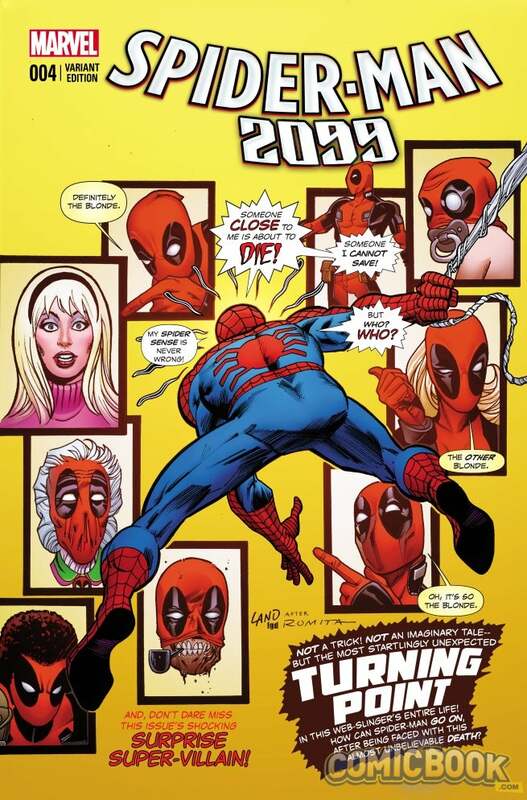 The cover replaces all of Peter Parker’s loved ones with Deadpool, pointing out what everyone, at this point, should already know. Spider-Man 2099 #4 is written by Peter David and drawn by Will Sliney, and will see Miguel O’Hara going up against the Scorpion. Spider-Man 2099 #4 goes on sale October 1.